LA MIRADA THEATRE FOR THE PERFORMING ARTS & McCOY RIGBY ENTERTAINMENT invite you to journey “Under The Sea” as it presents the fifth and final show of its 2015-2016 season, THE LITTLE MERMAID, music by Alan Menkcn, lyrics by Howard Ashman and Glenn Slater, book by Doug Wright, musical direction by Colin R. Freeman, choreography by John MacInnis and directed by Glenn Casale. THE LITTLE MERMAID will preview on Friday, June 3, 2016 (with a press opening on Saturday, June 4) and run through Sunday, June 26, 2016 at La Mirada Theatre for the Performing Arts, 14900 La Mirada Blvd in La Mirada. Full of Disney magic! In a magical kingdom beneath the sea, the beautiful young mermaid Ariel longs to leave her ocean home to live in the world above. Based on one of Hans Christian Anderson's most beloved stories and the classic animated film, Disney's THE LITTLE MERMAID is a hauntingly beautiful love story for the ages. 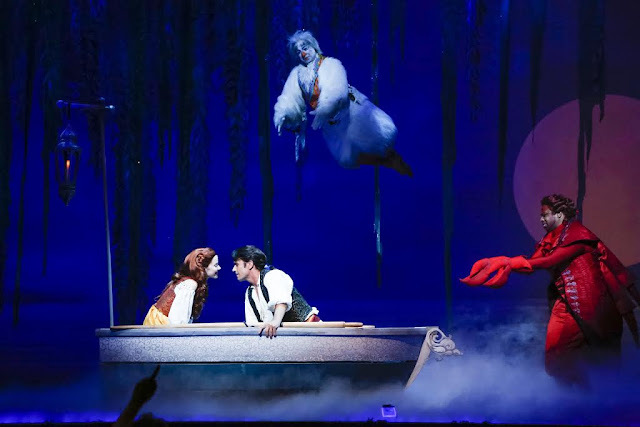 With music by eight-time Academy Award-winner Alan Menken, this fun for the whole family, fishy fable will capture your heart with its irresistible songs including "Under the Sea," "Kiss the Girl," and "Part of Your World." THE LITTLE MERMAID will preview on Friday, June 3, 2016 and run through Sunday, June 26, 2016 at La Mirada Theatre for the Performing Arts, 14900 La Mirada Blvd in La Mirada. Performances are 7:30pm on Wednesdays & Thursdays; 8pm on Fridays; 2pm and 8pm on Saturdays; and 2pm on Sundays. There will be additional performances on Sunday, June 19 at 7pm; Tuesday, June 21 at 7:30pm & Sunday, June 26 at 7pm. Talkbacks with the cast and creative team will be on Wednesday, June 8 and Wednesday, June 22. Tickets range from $20 - $70 and can be purchased at La Mirada Theatre’s website, or by calling the La Mirada Theatre Box Office at (562) 944-9801 or (714) 994-6310. Student, Senior, Child and group discounts are available. Parking is free.